7Up? Coke? Orange Fanta? Which is least likely to dissolve me from the inside-out? With every passing year, more and more American soda drinkers are switching to water. But we still haven’t even come close to truly conquering our collective soda addiction: The average American drank more than 38 gallons of soda (approximately eight 12-ounce cans per week) in 2013, and the average household spent more money on soft drinks than any other food item in 2011. 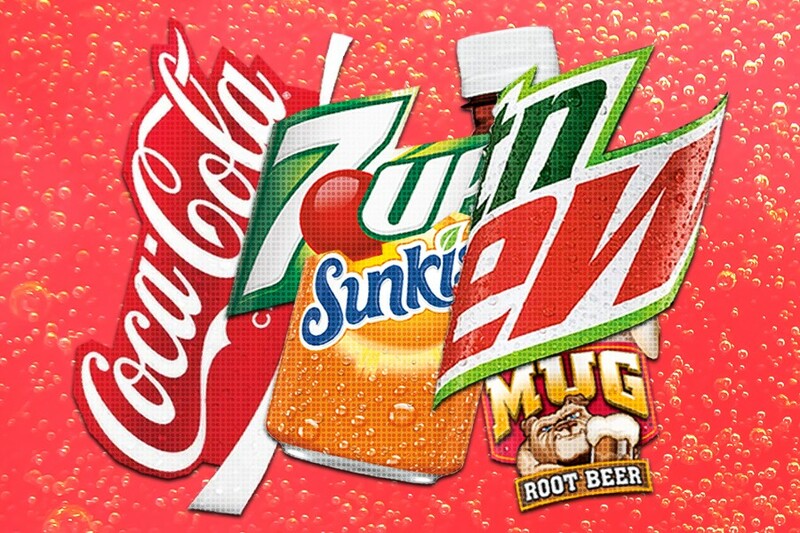 But if you absolutely must have your sugary soda fix, consider this: Among the massive ranks of sodas, some are slightly less unhealthy than others. To find out which are least likely to scramble your insides, I asked Hunnes to help me rank some popular brands, from least unhealthy to most unhealthy. Since most sodas contain more or less the same ingredients, Hunnes follows the same methodology that she used during our ranking of diet sodas: Basically, the clear sodas are the ‘safest,’ since they don’t contain artificial colors, which all appear to be potentially carcinogenic. The dark sodas contain high levels of caffeine and caramel coloring, both of which are far from healthy. Finally, the yellow (and orange) sodas contain some of the most dangerous dyes, according to Hunnes. So much like diet sodas, the simplest way to rank regular sodas by how healthy they are is to lump them together by color, with clear sodas being the least unhealthy, dark sodas being the most unhealthy and yellow (or orange) sodas sitting somewhere close to the dark ones. 1) 7Up and Sprite (tied): “The ingredient lists for 7Up and Sprite are nearly identical, as are their nutritional labels: 140 calories and 39 grams of carbohydrates (aka sugar) each,” Hunnes explains. “The high-fructose corn syrup is obviously the worst thing about them: There’s no nutritional benefit to consuming high-fructose corn syrup, and sadly, it’s lipogenic, meaning it may metabolize into fat molecules in addition to breaking down into sugar.” But hey, these don’t contain artificial colors at least! 4) Pepsi and Dr. Pepper (tied): Pepsi and Dr. Pepper contain, more or less, the same ingredients as Coke, but Hunnes points out that they boast 10 more calories and two more grams of carbohydrates (aka, sugar) each. 6) Pibb Xtra: Pibb Xtra contains the same ingredients (and the same number of calories and carbohydrates) as Coke; however, it’s also comprised of polyethylene glycol, “Which is the same ingredient found in Miralax, an osmotic stool softener,” Hunnes warns. In other words, Pibb Xtra may give you the runs. 7) Mug Root Beer: “Mug Root Beer contains 160 calories, 43 grams of carb (which adds up to 11 teaspoons of sugar), high-fructose corn syrup, caramel coloring and quillaia extract, which is apparently used to treat athlete's foot,” Hunnes says. 8) Mountain Dew: Again, Hunnes ranks these lower than dark-colored sodas mainly because they contain yellow and red food dyes, which are potentially carcinogenic. “Mountain Dew is rated slightly higher than the next two, only because it contains a small amount of orange juice,” Hunnes explains. “But while it does contain a little orange juice, it also contains high-fructose corn syrup, and yellow number 5 dye, which has been shown to be possibly carcinogenic. The brominated vegetable oil that [Mountain Dew] also contains is an emulsifier, but it can potentially build up in fatty tissues and cause ill effects.” Excessive consumption of brominated vegetable oil may lead to bromism, a condition that causes mental dullness and muscular weakness. 9) Sunkist and Orange Fanta (tied): “Sunkist contains 170 calories, 44 grams of carbohydrates (which adds up to 11 teaspoons of sugar), high-fructose corn syrup, yellow number 6 dye, which is a possible carcinogen, and red 40 dye, which is also a possible carcinogen,” Hunnes says. “Orange Fanta appears to be nearly identical to Sunkist.” It’s worth noting that Orange Fanta contains 10 fewer calories, but one more gram of carbohydrates than Sunkist. But that doesn’t discount the fact that all sodas contain zero beneficial ingredients and loads of terrible ones. So do yourself a favor, and stick to water instead.